Yesterday's Cotton Bowl win was the last time a Watt brother will dress in Badgers red. Wisconsin junior linebacker T.J. Watt announced on Tuesday morning via Twitter that he is entering the NFL Draft. The 2016 All-Big Ten first team selection and second-team AP All-American officially declared for the draft, following in the footsteps of his two older brothers, J.J. and Derek. Watt had 63 tackles, 15.5 TFL and 11.5 sacks for the Badgers this season. His 11.5 sacks were the most for a Badgers player since O'Brien Schofield had 12 in 2009. Watt will forego his senior season, just as his older brother J.J. did when he declared for the NFL draft after the 2010 season before being selected by Houston in the first round. T.J.'s other older brother, Derek, played four years for the Badgers and was drafted by the San Diego Chargers last year. T.J. Watt finished his Wisconsin Badgers career with a 24-16 Cotton Bowl win over Western Michigan. He recorded four tackles and a sack in his final collegiate game. T.J. Watt will join his brothers in the NFL. The Wisconsin linebacker, the younger brother of Houston Texans star defensive end J.J. Watt, announced Tuesday on Twitter that he will forgo his senior season and declare for the 2017 NFL draft. The younger Watt established himself as one of the best pass-rushers in the Big Ten this season, leading the Badgers with 10.5 sacks and 14.5 tackles for loss. He also had 63 tackles, an interception and two forced fumbles this season for the Big Ten West champions. Watt played sparingly before breaking out this year as a redshirt junior as an outside backer in Wisconsin’s 3-4 defense. He redshirted his first year on campus and then missed the 2014 campaign due to injury. In 2015, he played in all 13 games but had just eight tackles and 1.5 tackles for loss. T.J., an expected second- or third-round pick, will be the third Watt brother to play in the NFL. J.J., of course, is a three-time NFL defensive player of the year. Derek Watt, a fullback for the San Diego Chargers, was selected in the sixth round of the 2016 draft. All three Watt brothers played for the Badgers. Wisconsin is awaiting a draft decision from one other junior, tackle Ryan Ramczyk. Ramczyk told reporters last week he received a first-round grade from the NFL Advisory Board, but an upcoming hip surgery complicates his decision. The hip issue would likely prevent the 6-foot-6, 314-pound Ramczyk from working out for teams leading up to the April draft. On Monday, Wisconsin concluded its season out with a win over Western Michigan in the Cotton Bowl. The Badgers finished with an 11-3 record. 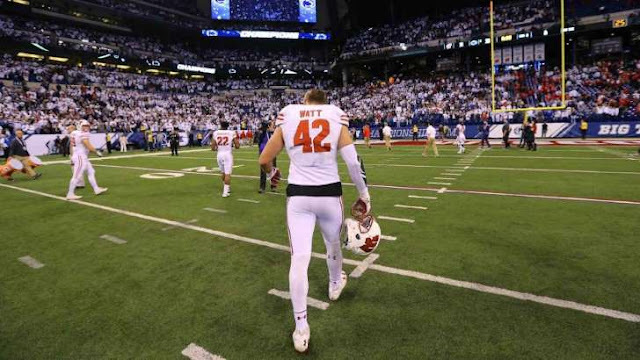 Wisconsin linebacker T.J. Watt announced he was leaving school early and entering the 2017 NFL Draft. Perhaps you’ve heard of his brother, Derek, the Chargers fullback. And the other one, whose name is one initial different from T.J.’s. The younger Watt had a sack in yesterday’s Cotton Bowl win over Western Michigan. He had 11.5 sacks this season, and was a second-team All-American. His pass-rush ability and his family ties should make him an intriguing prospect in his own right, though it might be years before he’s mentioned in a story without the other ones turning up. 0 Response to "Badgers linebacker T.J. Watt declares for 2017 NFL Draft"